For those applications where the ENC12/14 enclosure is too small and the ENC16/18 is too big, the new ENC14/16 enclosure is just right. The inside dimensions are approximately 14” wide x 16” long x 7.5” deep. 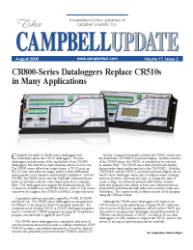 The ENC14/16 is the preferred enclosure for housing a CR5000 datalogger. For applications that require a larger power supply, the enclosure will accommodate a BP12 or BP24 battery, charging regulator, datalogger, and one or more peripherals. There are three enclosure mounting bracket options. One option attaches the enclosure to a tripod mast or vertical pipe. Another option attaches the enclosure between the legs of a CM110-series tripod, and the third option attaches the enclosure to two legs of our towers.